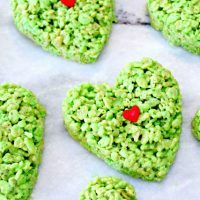 Homemade Rice Krispie Treats are a favorite in our home, but during Christmas we like to kick them up a notch and make these super cute Grinch Heart Rice Krispies Treats…easiest recipe ever and they are oh so delicious! How the Grinch Stole Christmas has been one of my favorite holiday cartoons and movies since I was a little girl. I loved the book, the original cartoon version and also love Jim Carrey’s movie version. I guess I am just a Grinch loving girl at heart! My favorite quote from the book is, “Well, in Whoville they say – that the Grinch’s small heart grew three sizes that day. And then – the true meaning of Christmas came through, and the Grinch found the strength of ten Grinches, plus two!” Hence, the green hearts with the small red heart in the center. During the holidays, my daughter and I love to make treats like our White Chocolate Christmas Mix, White Chocolate Christmas Bark, and these Peppermint Pretzel Bite Candies. 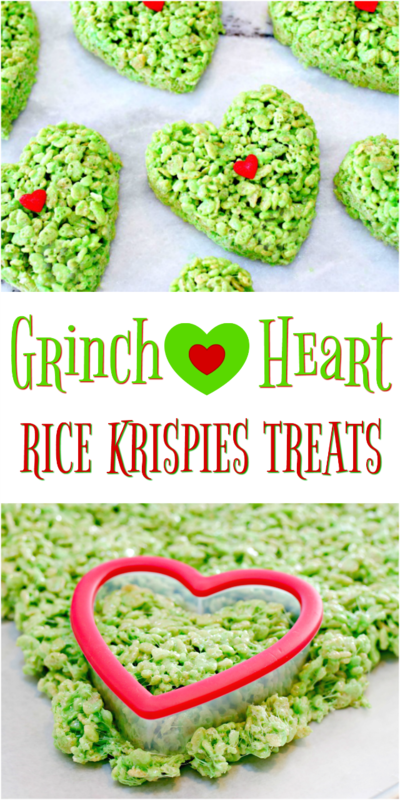 This year we decided to add a new, fun, Grinch inspired treat to share with our friends, so the Grinch Heart Rice Krispies Treats were born. They were so easy to make, are so yummy, and quite possibly the cutest treats ever! 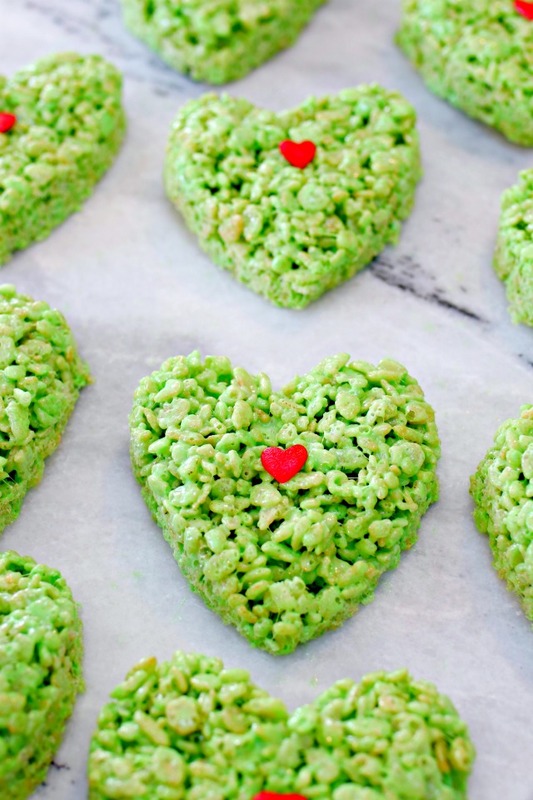 Start by making green Rice Krispies Treats. What do you need to make Rice Krispie Treats? Mix in and melt the marshmallows. For the green Grinch Heart version, stir in 4-5 squirts of green food coloring or more until you get the desired shade of green. Remove from heat and slowly stir in the Rice Krispies cereal. 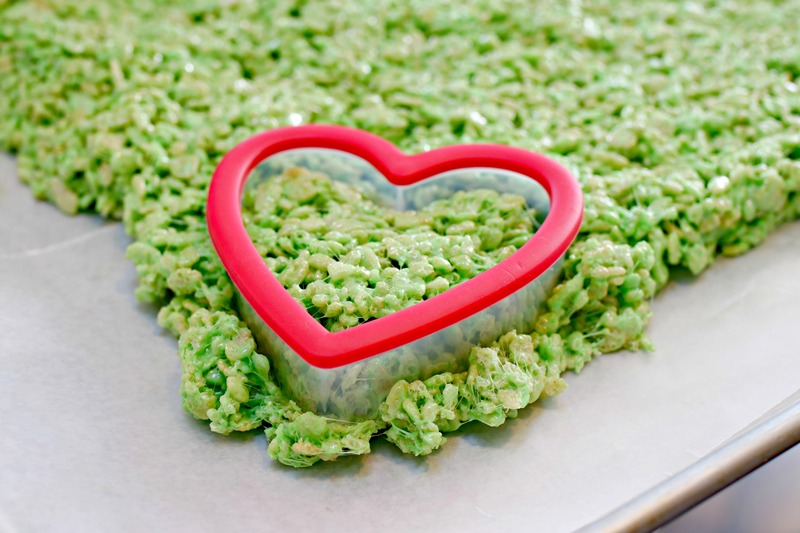 If you don’t want to make heart shaped Rice Krispies Treats, use a buttered spatula or wax paper evenly press mixture into 13 x 9 x 2-inch pan coated with cooking spray. Cool. Cut into 2-inch squares. 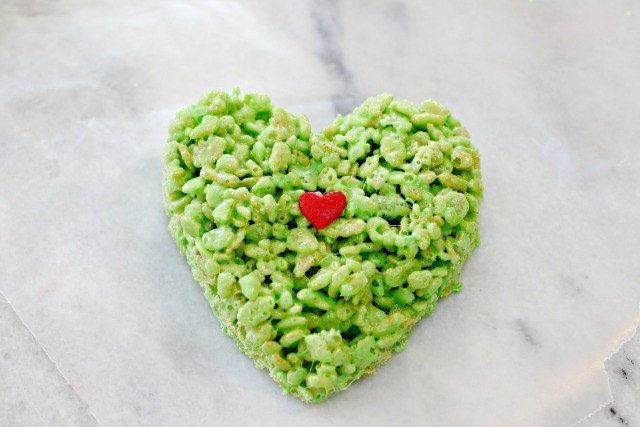 For the Grinch Heart Rice Krispies Treats, follow the directions below. 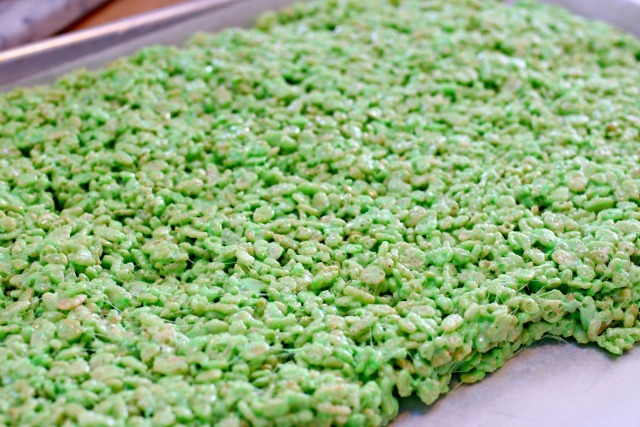 Place a sheet of wax paper on a large cookie sheet and spread the Rice Krispies treat mixture onto the pan evenly. It should be about and inch thick. Use a heart shaped cookie cutter to cut out the hearts. Place the heart cut-outs on a piece of wax paper. Place a heart shaped candy in the center of each green Grinch heart. Enjoy! Aren’t the the cutest little Grinchy hearts you’ve ever seen? Eat them all up yourself, or share them with friends. These also make a super fun treat for kids at Christmas parties or would be super fun to nibble up while watching How the Grinch Stole Christmas with your kiddos! Stir in 4-5 squirts of green food coloring or more until you get the desired shade of green. Place a sheet of wax paper on a cookie sheet and spread the mixture on it until it is about an inch thick. Use a heart shaped cookie cutter to cut out the hearts and place them on wax paper. Place a heart shaped candy in the center of each heart shaped treat, pressing down so it will stick. 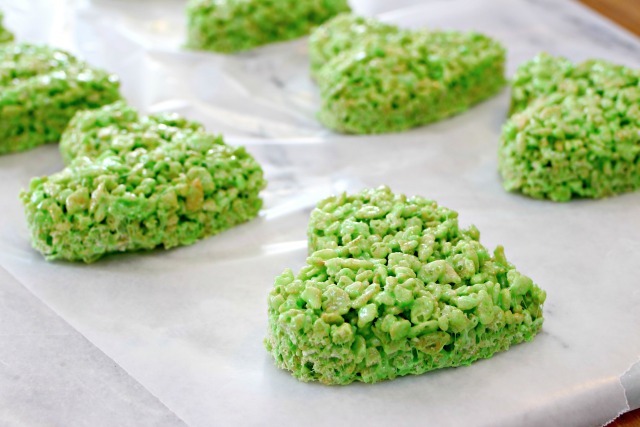 This green version of Rice Krispie Treats also makes really cute Christmas trees. Just use a cookie cutter in the shape of a Christmas tree instead of a heart, and decorate with colored icing! Another great Christmas idea I make using the same ingredients as this is to put the green rice krispies into a greased bundt pan that has some red cinnamon candies placed on bottom and when it is set, turn it out onto a plate and it is a beautiful Christmas wreath.